Elaeagnus pungens is a species of flowering plant in the family Elaeagnaceae, known by the common names Nawashiro-gumi thorny olive, spiny oleaster and silverthorn; also by the family name "oleaster". It is native to Asia, including China and Japan. Today it is widely spread throughout temperate and mediterranean regions of the world. Primarily this plant seems to be used as a ornamental shrub used in landscaping. However, the Elaeagnus genus deserves more attention in agroforestry and sustainable agriculture in general for their nitrogen fixing properties, edible berries and seeds and promising medicinal properties. It was also used to abandoned mining sites in Kentucky and other areas. Freshly sewn seed should germinate freely within 4 weeks, though it may take 18 months. Stored seed can be very slow to germinate, often taking more than 18 months. A warm stratification for 4 weeks followed by 12 weeks cold stratification can help. Despite its invasive potential, E. pungens is widely cultivated as a garden plant in temperate regions. It tolerates varied environmental conditions, including heat, cold, wind, coastal conditions, shade, and full sun. It is very drought-tolerant. It can grow in varied soil types, including those found at mine spoils. Numerous cultivars have been developed, especially for variegated foliage effects. I encountered this Mexican hawthorn tree at the Gold Ridge Experimental Farm in Sebastopol, CA - Luther Burbank’s former laboratory. Although much of the acreage has long been converted to housing development and only a small tract of the former farm remains, there are some interesting trees surviving. One area I return to whenever I visit is the small group of Cratageus species in the back where a few species, including C. mexicana, are still thriving. Compared to the Chinese Hawthorn, C. pinnatifida, the Mexican hawthorn tastes much better out of hand and has an interesting aroma, reminiscent of some obscure tropical fruit or synthetic bubblegum. The fruit of Crategeus mexicana is eaten in Mexico cooked, raw, or canned. It resembles a crabapple, but it has three or sometimes more brown hard stones in the center. It is a main ingredient used in ponche, the traditional Mexican hot fruit punch that is served at Christmas time and on New Year's Eve. On Dia de los Muertos tejocote fruit as well as candy prepared from them are used as offerings to the dead, and rosaries made of the fruit are part of altar decorations. A mixture of tejocote paste, sugar, and chili powder produces a popular Mexican candy called rielitos, because it resembles a tiny train rail. In some parts of Mexico, tejecote is taken for treating flu and cough, and also to prevent several cardiovascular diseases. Due to its high pectin content, the fruit is industrially processed to extract pectin for the food, cosmetic, pharmaceutical, textile and metal industries. Other uses include food for livestock (for which the leaves and fruits are used) and traditional medicinal uses; a Mexican hawthorn root infusion is used as a diuretic and as a remedy for diarrhea and fruit-based preparations are a remedy for coughing and several heart conditions. The Mexican hawthorn tree's wood is hard and compact, it is good for making tool handles as well as for firewood. I first encountered this spectacular quince species at the Burbank Experimental Earm in Sebastopol, California. Notable for its massive fruit, which is at first a light green then turning yellow as it ripens. Among the apples, Sorbus domestic, and a number of other surviving Burbank species this one seems to be growing strong and quite productive. The tree is a deciduous, semi-evergreen tree in the Rosaceae family (Rose, Pear, Apple, Loquat). Native to Eastern Asia in China this is the sole species in the Pseudocydonia genus. Previously Pseudocydonia was placed in the Asian genus Chaenomeles, however differs in that Pseudocydonia lacks thorns and produces single flowers. The Chinese Quince is closely related to the European Quince, Cydonia bologna. The two species differ in that Chinese quince has somewhat serrated leaves and smooth fruited skin. The fruit on the Burbank Hybrids also appear to grow larger. The tree is referred to as mùguā-hǎitáng (木瓜海棠).In Chinese, mùguā (木瓜) also means, “papaya”. Grows 8-10 m long. The fruit is a large ovoid pome 12–17 cm long with five carpels; it gives off an intense, sweet smell and it ripens in late autumn. The large fruit is hard and astringent, however after a period of frost the fruit does become a bit softer and less astringent. The fruit can be used in the same way as quince, poached, baked or used for making jam. The tree is also grown as an ornamental in Southern Europe. In Korea it is used to make a preserved quince and quince tea. The bark and trunk of larger trees are highly ornamental. The wood is frequently used in Japan for shamisen, a three-stringed traditional Japanese musical instrument derived from the Chinese instrument sanxian. The fruit is used extensively in Traditional Chinese Medicine to treat rheumatoid arthritis. Recent pharmacological studies suggest that extracts of phytochemical in the fruit have antioxidant and antiviral properties. Capparis spinosa growing in its natural habitat, on the limestone coastal cliffs in Kefalonia, Greece. I'm pretty sure this is Canarium commune (photos below), a close relative of Canarium ovatum, the Pili Nut. I took this photo and collected seed from Summit Botanic Garden outside of Panama City in Central America where they also have a collection of Pili nut among many other interesting species from their earlier years as an experimental garden. Canarium commune, also known as Java Almond or Kenari Nut, is a tree native to Southeast Asia from Indonesia to New Guinea. The edible nut / kernal can be eaten raw or cooked and is prepared in a variety of ways. In its area of origin it is highly valued as a traditional snack. The nuts can be used as a substitute for the common almond. Nuts can be ground into a powder and used to make bread. The seeds are used in a wide variety of dishes by the local people. The seed contains about 72% oil, 13% protein and 7% starch. Interestingly, it has been found that adding a strained emulsion of the crushed, ripe kernels to cows milk will make the milk much more digestible when fed to babies and infants. An edible oil is obtained from the seed which is preferred to coconut oil by local people where Java Almond is traditionally grown and consumed. An oil derived from Canarium commune is also used in the cosmetic and aeromatics industries called Elemi Oil. Elemi produces a bright lemony, woody fragrance with a hint of fennel, frankincense and grass. Elemi is known to be clarifying and cleansing with energizing properties. It stimulates mental ability and works well for morning meditation, tai chi or yoga exercises. It creates a spirit of hopefulness and is said to relieve depression. Traditionally, people use elemi with substances that are refreshing and cleansing such as mastic, lemongrass, and sweet grass. Elemi is also used topically to treat skin disorders and ulcers. In agroforestry systems the tree is traditionally planted in nutmeg groves to provide shelter and shade and a secondary overstory crop. The tree and its various products have a wide range of additional traditional uses. Native to Malaysia and Indonesia, the Rambutan is one of the most popular and common fruits in Southeast Asia where it is grown both on a domestic level, as a patio tree, and at a commercial level. It has been introduced to some areas of Africa and Central America, like Costa Rica and Panama, to a lesser extent. The Rambutan is a medium size tree reaching 15 -25 meters in height, with a straight trunk and a dense canopy. The fruit is the shape of an egg encapsulated in a red, yellow, or sometimes orange casing covered in soft spiny hairs. The sweet, juicy, aromatic fruit is translucent and surrounds a large seed. There exist freestone cultivars. Fruit can range in acidity, yellow varieties tending to be more acidic than red. Reportedly the seed is edible. I forget where I first heard this, but I have eaten the seeds raw, which are not disagreeable in flavor and gave me the sense that they were especially nutritious. Any further info regarding Rambutan seed edibility would be greatly appreciated. The Rambutan fruit, like the Lychee, is rich in sugar (11%) and vitamin C.
There are more than 100 varieties of Rambutan in Indonesia, Malaysia and Thailand. Culitvars are distinguished by whether they are best consumed fresh (Ayer Mas, Chooi, Ang, Kelip, Rongrien, Tau po Cheng), or used in preserves (Chompu, Kepala Besar). The Rambutan is a tree from the humid tropics. It isn't found cultivated higher than 600 meters. It has not been successfully cultivated in Florida and other subtropical areas and does not tolerate long periods of drought. The tree is not especially selective in soil type although it does best in heavy clay soils with a heavy organic mulch layer. The Pulisan is native to South East Asia, widely cultivated in Indonesia, especially on the island of Java. It is also relatively well known in Malaysia, Thailand, and the Philippines. The tree grows up to 10 - 15 meters, with spreading branches and an irregular crown. The fruit is 5-8 cm long and 3-5 cm wide encased in a red or yellow capsule covered in short, soft spines, similar to that of the Rambutan, a close relative to the Pulasan. The fruit is most similar to the Rambutan, typically consumed raw, also made into marmalades and preserves. There are two known groups of Pulasan varieties. Dark red and yellow. There are freestone cultivars in both groups. The most prized varieties are "Silbabat" and "Koneng". The Pulasan requires a hot, humid climate. Trees cannot withstand prolonged dry seasons. To obtain quality fruit the tree needs deep, well drained soil, rich in organic matter. The tree is propagated by seed, graft and air layer. This is a large Citrus species. The fruit were given to me years ago when I lived in Panama City's Old Quarter. Almost everyday I would visit a fruit vendor in Santa Ana to buy a small watermelon and a pineapple. He knew I worked with plants and collected fruit species so occasionally we would exchange fruit. I would bring miracle fruit, jaboticaba, jackfruit, curry tree fruit, and others, none of which he had ever seen. Him and his family would bring me highly regarded or lesser known fruit varieties from the interior of the country, giant Nance, Algarrobo (Hymenia coubaril), Mangos. 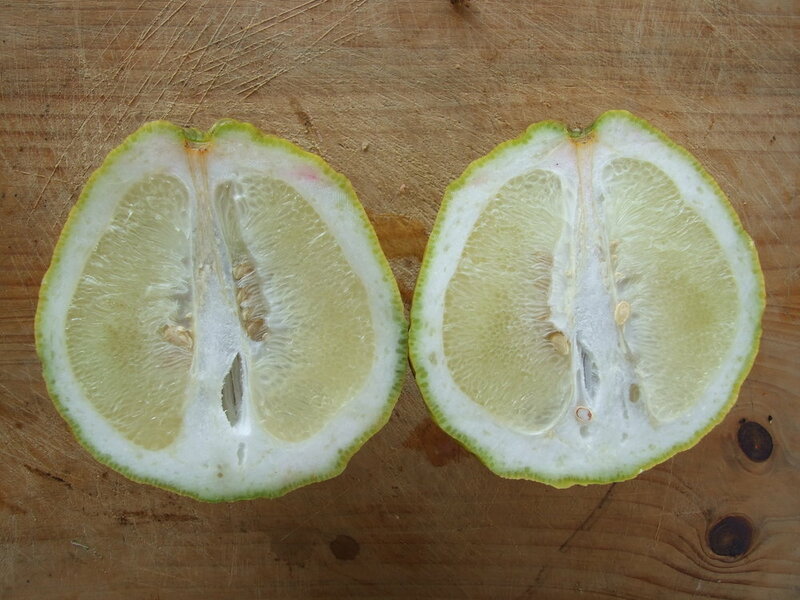 I never verified the species of this particular Citrus, it looks like some kind of Pomelo / Citron hybrid and has a relatively think skin compared to the size of the fruit. Any thoughts on the species?